The Iraqi National Bank announced on Thursday that the number of companies benefiting from the initiative to support small and medium enterprises launched by the Central Bank of Iraq reached 300 companies. He pointed out that the spread of these electronic payment cards is still weak in the Iraqi market, pointing out that the Board of Directors recently decided to launch A plan to cover the next three years includes several strategic directions to improve the financial performance of the bank and its infrastructure. 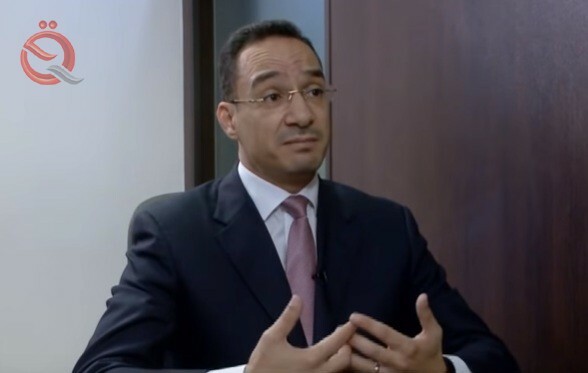 "The bank adopted the initiative of the Central Bank to support small and medium enterprises in a serious and important, and we are one of the first banks to exploit this initiative," said the director of the Iraqi National Bank Ayman Abu al-Hill in a televised dialogue sponsored by the Association of Iraqi Private Banks. What is the nature of the work of the Iraqi National Bank? - The Iraqi National Bank was established in 1995 and currently has a capital of 250 billion Iraqi dinars, which is the minimum required by the Central Bank of Iraq. Since its establishment, the bank has been developing in all aspects. , Dealing with various economic sectors. How much does the NCB partner, Capital Bank of Jordan, own from the bank's capital? - Capital Bank's share is 62% of the capital of the National Bank of Iraq. Through this partnership, the Bank has access to the world, with Capital Bank as its main correspondent, as well as technical, human and banking support to be provided through Capital Bank to the National Bank of Iraq. To what extent has the partnership between the local and foreign banks increased the Iraqi economy? - Each country seeks to attract foreign investment. The investment of Capital Bank in Iraq is one of the main forms of foreign investment in the Iraqi banking sector. The exchange of expertise is the most important factor in this partnership, such as banking expertise, banking infrastructure, electronic services and development courses. What is the nature of the agreement signed between the Iraqi National Bank and the International Finance Corporation and what are their objectives and to what extent will improve the work of the bank? - A partnership with IFC is very important. We have been working on this project for about a year. The agreement is a simplified representation of the Bank to the International Trade Finance Program. We are the only Iraqi bank. IFC guarantees or guarantees If the bank has been issued a documentary credit to one of the bank's customers for a European, American or Asian bank, the existence of the World Bank guarantee leads to the acceptance of our credit directly, and the name of this institution in the adoption or letter of guarantee issued by the bank Ahli Iraqi open to himWAP and many areas, especially the diversification of network correspondents, and without this institution, it is certain that the situation will be different. What do you rely on after signing this agreement and what is the best use of it? The objective of the agreement is mainly to serve the customers of the bank and enable the bank to open letters of credit to the customers of the bank smoothly and at a low cost, thus this agreement enables us to serve the customers of the bank in the fastest and easiest way, considering that the bank targets all segments and at the level of large companies, To the retail sector. The bank also provides a variety of services to meet the needs of our clients, and the Bank strives to develop and diversify customer services. How effective are the electronic payment cards issued by the National Bank internally and externally? - The spread of these cards is still weak in the Iraqi market, as the Iraqi citizen prefer to exchange currency manually, but we as a bank try to offer our services in general and link credit card services within the products to provide to customers, in addition to contributing to public awareness and education using electronic cards and benefits And its ability to operate inside and outside Iraq. What are the contributions of the Iraqi National Bank in supporting small and medium enterprises within the initiative of the Central Bank? - The Iraqi National Bank adopted the initiative of the Central Bank to support small and medium enterprises in a serious and important, and we are one of the first banks to exploit this initiative. The number of companies that benefited from this initiative through our bank reached 300 companies, considering that our bank targets various economic sectors, whether agricultural, commercial or industrial. The terms of obtaining this financing are relatively reasonable conditions, including the visit of a specialized team from the bank to the headquarters The company in order to ensure the existence of the project, as for the benefit is a mutual benefit means the benefit of the company and the bank. The bank has made profits through this initiative as being partially supported by the central bank. What is the role of the National Bank of the project to settle salaries? - The project of localization of salaries of the strategies of the Iraqi National Bank, and we entered this project since its inception and we have signed contracts with more than 20 ministries and companies affiliated to those ministries, and we now have 8000 salaries transferred to the Iraqi National Bank. In our opinion, this number is modest compared with the large number of Iraqi employees. Our plan for the next three years aims to double that figure. What does the Iraqi Bank Ahli have plans to develop in the future? - The Board of Directors of the Bank has recently decided to cover the next three years, which includes several strategic directions to improve the financial performance of the Bank, its infrastructure and human resources, and we hope to reach this strategy to cover all aspects and thus enable us to reach a better position in the future. What is your view of the banking sector in Iraq and your assessment of it and to what extent there is competition between private banks? - The banking sector is constantly evolving, and the central bank plays a very important role in this development through supporting private banks and providing many initiatives .. In general, I am optimistic about the future of the Iraqi economy. I call on the Central Bank to speed up activating the Deposit Guarantee and Excellence between effective banks and performing banks At least, because the presence of the weak bank affects the rest of the banks, in addition to the partnership between the private sector and the public and the government's confidence in private banks.